The Runner may spend click to break any subroutine on Markus 1.0.
subroutine The Runner trashes 1 of his or her installed cards. The forge must never run cold. This ICE is a nice alternative to Eli 1.0. Whilst Eli is a pain to get through (costing either 4 credits on corroder or two clicks), there are no consequences to messing up, beyond ending the run. You simply bounce. Markus, by contrast, carries a powerful ability mitigated by the bioroid ability and the fact that the runner can choose. 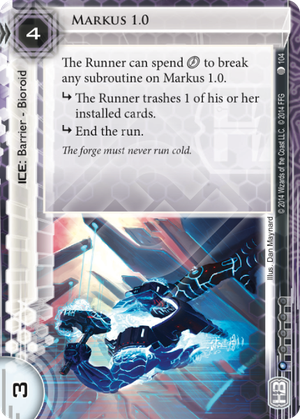 It is more of a taxing ICE than a stopping ICE, as the runner really won't want the ability to fire. Better comparisons would be Ichi 1.0 and Viktor 1.0: if the abilities fire, fantastic, but they are mostly there to force the runner to spend clicks and credits to avoid damaging effects. Perhaps it should cost 3, but it does have some subtle advantages: it is the only barrier with a destroy effect (except Galahad with Lancelot), and it is also a card capable of destroying without actually being a destroyer (Only Taurus and Flare can claim the same). This allows it to get around sharpshooter. Finally, it can potentially destroy any card. I would certainly consider running these in RP instead of Eli. The first thing that springs to mind is a certain other Bioroid barrier ice that is the same strength and has the same number of subroutines for 1 credit less (Eli 1.0). It's easy to compare Markus to Eli but Markus's strengths as a Bioroid barrier are nuanced. When the runner is scouting ice early game, runs 1st click and Eli pops up, they're really in no danger and can safely bounce off and react accordingly with their 2nd click. If they're scouting ice and they happen across Markus, they absolutely want to break or at the very least click the first subroutine if a barrier breaker isn't around, and clicking past subroutines is a horrendously poor use of resources early on. The capacity to trash R&D Interface and/or Desperado rolled into a piece of ice really cannot be overlooked, especially against Criminals (I'm looking at you Gabriel Santiago). I feel the fact the Runner still chooses what gets trashed is ironically immaterial: it will slow down whatever combo they're trying to pull off and requires them to run some card-redundancy to avoid hard decisions with cards they want to stick around. Markus cannot and will not ever replace Eli 1.0 as Haas-Bioroid's #1 cheap barrier. But he arguably supplements other ice better than Eli does for the fact Eli is a speedbump but Markus is a speedbump studded with nails that can lead to some rather sore injuries if the runner slips, depending whether Markus is leading in front of ol' Zed 1.0 or is following in the shadow of Ichi/Heimdall. Viktor 1.0 is an excellent buddy for the fact it then requires 2 different breakers (or all of the runner's clicks) to get past the pair unscathed. Okay, I'm going to make the obvious comment, in the hope that someone will have an excellent argument to prove me wrong. This is just worse than Eli. It costs more, and it's not as strong. Sure if you hit it without clicks it's slightly harsher but even against HB few runners will be running unrezzed ice last click, especially now architect is out. I guess that it definitely costs a click to hit, whereas you can just bounce off Eli. Nonetheless, I can't see that advantage swaying too many people. The fact that the runner choses what to trash in adittion to the stats so easily inferior to eli, this card is easily a "strictly worse" but its strictly worse than Eli, the (or at least one of the) best ice in the game. Maybe one will fit in somewhere when you want the 4th taxing barrier, but its hardly an upgrade from bastion/wall of static. Against atman 3 can be better than 4 though, but again... wall of static? With the MWL doubling Eli 1.0's influence cost, Markus suddenly doesn't seem all that bad. The deck that most easily switches to Markus is (IMO) Jinteki: Replicating Perfection, because it works as an outer-taxing barrier on centrals. Sadly, it rez's for 1 more, and has 1 lower strength, but the unique destructive power partly makes up for that. Worst case, it taxes for 1 or Corroder for 2. Best case, it blows something up and ends the run. Yeah.. not that strong card. Compared to Eli, it costs 1 more to rez, and has 1 less strength. Punishing Barrier? Hmm. In the very early game, the runner can just get through with 1 click without installing any cards... And if they installed some cards, this card can work like Enigma or Eli... Hmm, not that attractive. Well, anyway Stronger Together will love this card. At least this card will make them have 3 super-Eli and 3 Eli in their deck. And if they're using Heinlein Grid, this can be better than Eli sometimes. This card trashes ANY installed card. Any resource, any hardware, etc. This is a very rare ability that is regularly overlooked and always has challenging requirements. It is also a barrier which does this, which is unheard of. Of course, as a clickable bioroid, how do you get this ability to fire? You need to combine this card with False Lead or Hand of Tyr to force it to land.